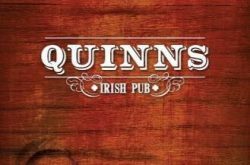 On paper, Quinn’s Irish Pub is just the kind of place we want to like – an informal meeting place for friends, rowdy but not deafening, where you fit in with after work khakis or Saturday afternoon jeans and flannel. These are the places we adopt as “our own” to enjoy with friends and neighbors. All of this, of course, hinges on one thing: cuisine. We want honest, non-industrialized menu items that are fairly priced and delicious. And as we slide into winter, this means plateloads of comfort food and crafty brews with assertive flavor. Once inside, a quick glance is all that’s required to get a “lay of the land.” Unlike the byzantine pubs in Dublin’s Temple Bar district, you won’t lose your way in Quinn’s. A long central bar is lined with big screens showing multiple sporting events overhead. Around that are tables for dining, and at one end, there’s a step up to some booths. After a reasonable 10-minute wait, we were seated. Around us were groups of all ages and families with little children. Well behaved, of course. Our server – no name offered this evening – exuded calm competence and directed our attention to the daily special menu. Tonight’s special was steamers, a favorite that’s always tempting. But the evening’s objective was comfort food; we’ll save clams for next spring. In that spirit, I started with a mug of Quinn’s Homemade Chili. My initial concern was that the topping of shredded cheddar cheese showed no sign of softening. Would I have to send it back for a proper nuking? Alas! That wasn’t at all the case, for as soon as I dug through lukewarm the top layer, I found the depths to be plenty hot and thick with soft red beans, chunks of ground beef and bits of tender green pepper. The tomato base was mildly spicy – the barely-1-alarm fire was easily snuffed out with a couple quaffs of Wormtown’s Bottle Rocket Pale Ale. It was the next course, our entrées, which would get to the very foundation of comfort cuisine. And, in view of the fact that this is an Irish pub, I just had to try the Big Fish and Chips. Quinn’s serves its fish on a paper-lined dish piled up with crazy-long, crispy French fries. As soon as I started digging into my plate-long fillet, it was obvious I’d entered fish-lovers territory. Quinn’s plates up a seriously large haddock fillet that’s been richly battered and fried to a deep, golden brown. But I’m very particular about fried fish and conducted an extensive analysis. Within that tasty golden shell, the white flesh was tender and just flaked apart. We’ve all suffered the manufactured product that other places try to pawn off as “fish.” Or thin little scraplets that are really just delivery vehicles for oily breading. Quinn’s generous portions of haddock are fresh and mild-flavored. Why sully them with tartar sauce? OK, so I liked my fish. How about my friend’s plate of Pete’s Irish Home Style Meatloaf? It’s hard to believe this, but he raved about Quinn’s meatloaf more aggressively than I did with my Big Fish. Two large chunks, a blend of ground beef and pork, were dunked in rich brown gravy and topped with fried shoestring onions. Mashed potatoes and a big portion of sautéed green beans completed the dish. But all he really paid attention to was the meatloaf; Quinn’s mix of herbs and spices must be exceptional. A few days later, when I mentioned that I’d been to Quinn’s Irish Pub, a neighbor gushed about the Shepherd’s Pie. What is about this place that gets people so fired up? This visit went a long way toward answering that question.